I love having a cocktail once in a while especially if I get back home from a long and tiresome day spent at work. In most cases, I resort to a Martini or just a plain glass of red wine, but sometimes I like something fancier than that. Don’t get me wrong. I’m not saying that consuming alcohol is a good thing, but it definitely helps me unwind from time to time. Since I realize that drinking too much is bad, I make sure to stop after two drinks tops. I’ve dreamed about having my own bar ever since I was a kid and used to watch movies with my dad. Do you remember those old films where the man walked into his living room and there was an amazing bar waiting for him whenever he needed it? I never had the money to get one right off the bat, meaning that I had to consider building it by myself. I’m sure many men like me enjoy a bit of DIY-ing in the weekend. I bought several tools for my workshop and started working on several wood pieces without knowing that I was inadvertently preparing myself for the great moment when I would finally build a bar. Something that I feel compelled to note is that you need to do your research on the matter and read as many articles as possible. 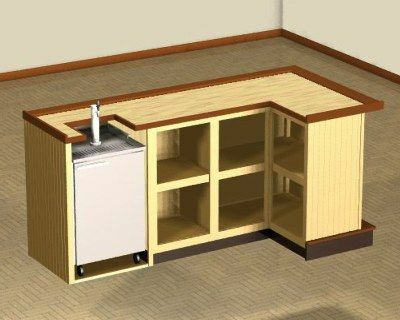 Popular Mechanics has several posts devoted to the topic, so you might have to download the plans, print them, and study them to see whether they go with the space you might have in your mind for the bar per se. Home Wet Bar has also made an article available and it is absolutely exceptional. It actually presents eight easy steps that you can utilize to complete the project all by yourself. It might be more difficult for you to build a bar if you don’t have the proper tools, so make sure that you own at least one table or circular saw, a powered drill, sand paper, tape measure, masking tape, saw horses, a hammer, a torch, and protective equipment. Depending on the size of your project, you might need extra tools and materials, but I can’t really recommend you anything considering that I don’t know the kind of bar you intend to build yourself. While the formerly mentioned resource can be used for putting together a solid bar that can withstand the test of time, it’s important to emphasize that it shouldn’t be used commercially and that it mostly addresses home users that might not use it hundreds and hundreds of times a day. To make it easier for you to make your decisions, here are nine free bar plans you can check out in your spare time. © 2019 Offline Corporate Life. Powered by WordPress & xFrontend.